Can Affordable Mini Storage Facilities Really Save You Money? People nowadays have a lot of stuff, and they like to keep it. Thus, renting storage facilities became a norm. Doing so saves them the hassle of having to work or live in a cramped place. Business tycoons see this as an opportunity and began investing in this fast-growing economic bubble. We’re talking about the storage facility trade. While this commodity varies in sizes, you must know which size is necessary to you. If you’re the type who only owns a few shirts and furniture, then you don’t need to rent enormous rooms. What you’re looking for is an affordable mini storage unit. Before renting a storehouse unit, better know how much you’ll be stashing in. There are often situations where people tend to rent storehouses too large than what is necessary. Don’t chew more than you can swallow. If you can’t commit to a large space, then get yourself an affordable mini storage here in Macy’s. You don’t need to waste money each month on unused space. Moreover, we will only charge you for the modules you are currently using. It goes without saying that those established in favourable places are more expensive. I’m referring to densely populated areas or within the city. Facilities which are central to everything would undeniably cost more. Also, another factor to a unit’s price is distance. The further you are from their facility, the higher the price would be incurred for transporting your stuff. But it’s totally different here in Macy’s. You don’t need to worry about where you’re situated or how to move your stuff. As long as you’re 20 km within our warehouse facility, delivery charges are free! And we only charge a very small amount if you’re located farther. You’re probably thinking “the bigger the better.” But utilising the storage space at hand is the key to making the most of what you’re paying for. You should downsize your needed space and arrange your important belongings in an organised manner. For example. If you have furniture, you can dismantle it and put it in a labelled container. This way, you can easily locate your things and save space at the same time. Make your budget work. You don’t need to get hefty spaces to accommodate things. Macy’s affordable self storage is more than enough. You can book online if you need consultation regarding the number of modules you’ll be needing. Our company is more than happy to help. Did you know that your rental rate is not written in stone yet? For most storage services, rates increase at some point, depending on how long you’ve been using their facility. It may only be a dollar or two for the first few months. But it could really add up if you’re planning to use their services for a long period of time. But not here at Macy’s. We keep our prices fixed. Guaranteed. No rate increases. What’s even more interesting is that you even get discounts the longer you use our facilities! 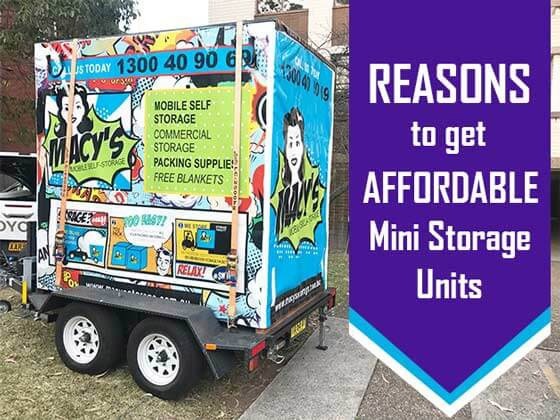 So if you really want to save money, make sure you give us a visit and rent an affordable mini storage. Renting one will definitely get you to save more than a few dollars in your bank account. To cut costs, only look for storehouses with features that are actually necessary. Why pay for something you don’t need? For example. Do you need a climate controlled facility? If no, then you don’t need to get one. Such features would only contribute to a higher rent. Are free rental trucks included for the move-in? By perks, we mean by this very process. In which by all means, Macy’s can provide. You don’t need to borrow a vehicle that can tow or get tangled with traffic, since your module is wheeled right in front of your doorstep. We can even wait for you to finish loading your stuff in your module before transporting it back to our warehouse. This bonus could definitely save you a lot of money compared to renting your own Ute. Having an extra space for your stuff is definitely a breather for you and your family. Get rid of excess baggage. You don’t need to buy extra cabinets or shelves for those old files and books. Here at Macy’s, you can rent an affordable mini storage and experience a clutter-free environment. If you need help with your stuff racking up, please visit our website. We have the right solutions and facilities for you. This entry was posted in Storage and tagged affordable storage units, mini self storage, mini storage.